This guest post comes from Becky Katz, who is spending a year in Berlin for the Robert Bosch Foundation Fellowship Program in urban planning. The huge mass slowly made its way through the city center and eventually ended at Pariser Platz, a public street in the shadow of the Brandenburger Gate. As an American, it felt reminiscent of demonstrations like the 1960s Civil Rights Marches and the 2016 Women’s March. The history of these streets should not be lost. In 1953, the East German Soviet government drove trucks and other armored vehicles into a crowd of 30,000 to 50,000 protesting construction workers and other anti-government dissenters. After fascism and communism, today in Germany’s democracy hundreds of thousands of people can gather peacefully. One power of a mass non-violent march is how it showcases democratic values of freedom to assemble and freedom of speech. But marches also showcase something else, something vital to cityscapes: public streets. The streets serve as the physical foundation and the enabler of demonstrations. The public streets of the Unteilbar Protest were the stage upon which hundreds of thousands of citizens could perform their civic rights. 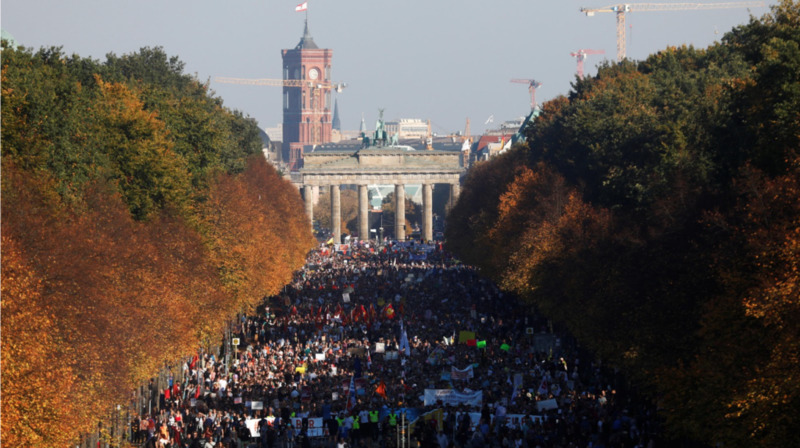 250,000 people gather on the public streets and squares around Berlin’s Brandenburg Gate for the #Unteilbar march on October 13, 2018. Living in Berlin for four months now, I can’t help but notice that the challenges facing Germany are similar to those in the United States. Social media echo chambers, swift political changes and divisiveness distract people from the unintended consequences of globalization, rapidly transforming economies, and climate change. Tobias focuses on the high points of functional local democracy but city politicians and private sector investors are creating new undemocratic challenges by enabling the loss of a city’s most vital public and democratic assets. Through abandonment legislation, land swaps, and new mega-private developments, city governments are allowing the privatization of public streets across the country, from the funny San Francisco Cul-de-Sac sale to Houston’s $2 million sale of streets. The City of Atlanta demonstrated this process of restraining and excluding in 2015, with its support for the abandonment of several downtown streets at the request of a private developer, for the long underused Underground Atlanta. During the Civil Rights protests of the 1960’s, these same streets saw the boycotting of segregated private businesses, police brutality, and many other injustices. Former Mayor Kasim Reed, in an Atlanta Journal Constitution article about the Underground deal, said, “If you were investing $350 million, I think most folks at home would want to control who has the right of entry to their campus.” He viewed the streets surrounding the development as independent from the democratic and urban fabric of the city, like a private backyard or a suburban office park. The history of Atlanta’s downtown streets during the Civil Rights Protests was not part of the conversation about the future of Underground Atlanta, but it should have been. And if Reed’s views were applied to the freedom to organize, one must ponder: is it right for a private developer in the middle of a downtown to be able to block peaceful protests on streets that have been previously paid for by hundreds of millions of public taxes? Particularly when they stand to profit from their private investments no matter who owns the adjacent streets? 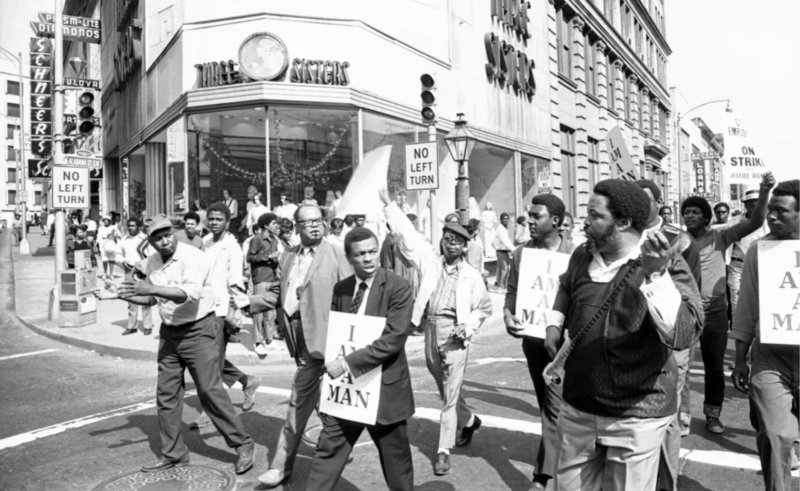 Hosea Williams leads protesters across Alabama Street during the Atlanta sanitation workers strike, April 13, 1970 GSU Digital Collections. From abroad, it was disappointing to see the City of Atlanta repeat the decision to not preserve public streets (or the space for public transit for that matter) in the Gulch deal. The idea that a private developer should have the right to control their ‘complex’ has persisted, even with $1.7 Billion of public subsidies. I think everyone can agree that downtown’s abandoned center is in need of development. But how this deal is structured, and the resulting development, will affect the City of Atlanta for hundreds of years. NRA protest march in Downtown Atlanta, alongside the Gulch, 2017. And so many questions remain: When the Gulch is developed with private streets, will all people feel comfortable to use them? When hundreds of thousands of Georgia’s women come together to protest national politics, will they be allowed to walk these new downtown streets? And when Black Lives Matter groups come together to demand the end of police violence, will that work with the private owners’ view of the ‘right’ type of activity? The new mayoral administration has made a huge push for affordable housing, but will these streets further exacerbate the stratification of people in different income brackets? Unfortunately, we have left this up to CIM Group (the Gulch developer) to decide and not Atlanta’s elected officials. And the effects this will have on Atlanta’s ability to remain a liberal bastion of open exchange and ideas are yet to be known. Even for those who rarely feel the rallying call to gather with thousands of others, there are still reasons for all to be upset. There are millions of constraints that can and do happen on private streets. Privately-hired cops can decide if you are the right fit, if your children can run and play, or if you can sit and gather with friends. Private owners can close down logical traffic connections, limit bike-riding through an area, or disallow a public bus stop. And as a citizen, if you were to bring up these limitations to your councilperson or mayor, they can then say, “I’m sorry but this is a private property issue, not an issue of the city.” Citizens cannot use their vote to change a private owner, as they can an elected official. Just spend a day in Atlantic Station’s heavily-controlled private streets and observe the small aggressions that can be found on a regular basis, all of them based on rules of conduct that can’t be changed by the public or elected leaders. This is not to say that city governments are perfect democratic institutes, but public streets owned and operated by governments ensure that democracy can be practiced in the open, unfettered by arbitrary permission requirements from privately-held organizations. Urban environments are dynamic places, constantly balancing interests for the widest range of people and public streets are essential to this balance. For cities to remain bastions of inclusion and democratic ideals, we must fight to ensure new and existing streets remain public. Otherwise, we might find ourselves without a stage upon which to demonstrate the value of community and democracy. Becky Katz is currently spending a year away from Atlanta in Berlin as a Robert Bosch Fellow. The Robert Bosch Foundation Fellowship Program offers mid-career professional development in urban planning, public policy, and more.